This is the circuit diagram for the practical part of my investigation. Current – kept constant at 0.50A by varying voltage supplied by power pack. Voltage – dependent variable measured by voltmeter. 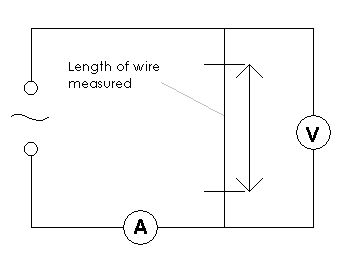 Diameter of Wire – kept constant by using the same wire for all readings. Material of Wire – kept constant by using the same wire for all readings. Length of Wire – independent variable; varied by changing contact points between wire and circuit. First I will cut a strip of the Nichrome wire approximately 1.20 m long and measure its diameter using the micrometer six times: at three evenly spaced points on the wire, rotating the micrometer by 90° to ensure that the diameter is the same throughout the wire and roughly cylindrical. Next I will fix the wire to the ruler. I will start by tightly fixing one end of the wire to one end of the ruler using sticky tape. Then I will ensure the wire is straight and tight before fixing it at a point approximately 0.35m down the ruler. I will repeat this at 0.65m and at the end of the metre ruler. Subsequently, I will connect the circuit as shown in the diagram, with the wire connected between 1.00m and 0.00m. Then I will begin to take measurements. I will turn on the power; adjust the supply from the power pack so the ammeter reads 0.50A. I will note down the reading on the voltmeter and then turn off the power. I will repeat this two more times with the wire at this length, turning off the power between each reading. Once the readings at this length are complete, I will turn off the power and alter the wire so that it is connected between 0.00m and 0.90m. 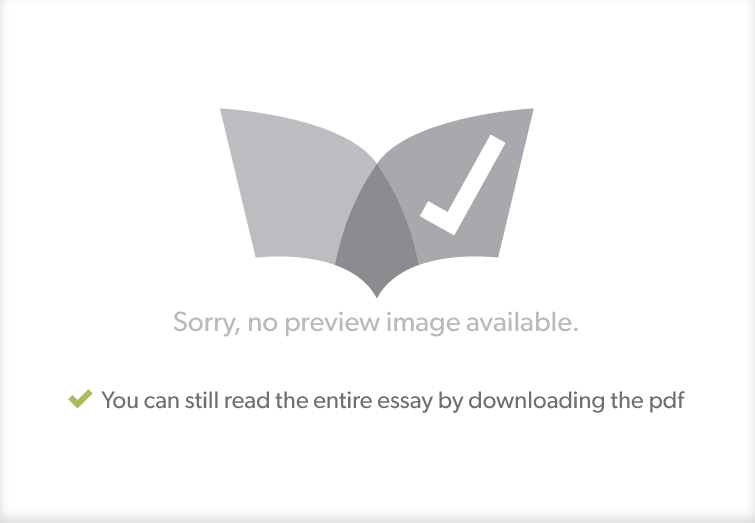 I will then follow the same steps to take reading at this length. I will continue to do this until all 0.10m intervals between 1.00m and 0.10m are complete. Diameter of Wire: measured using micrometer at three separate points on the wire. At each point I will measure the diameter twice, with readings at 90° angles to each other to ensure that the wire is cylindrical. Voltage across length of wire: measured using voltmeter at 10 different lengths of wire – from 1.00m to 0.10m at 0.10m intervals, each repeated three times. To prevent the wire from getting too hot, thus being a burn hazard, I will keep the current constant at a relatively low value of 0.50A. I will also turn off the equipment when I am not taking measurements. I will limit the current to 0.50A and switch off the power pack when I am not taking a reading to prevent the wire from heating up, which will alter the wire’s resistance and therefore its resistivity. I will fasten the wire to the ruler at four points to keep it straighter, avoiding any length discrepancies. The most likely significant source of error in my experiment will be the value for the area of the cross-section of the wire. This is derived from the diameter of the wire, which has a very small value (to the order of x10-4m), so it will have a large percentage error, even though the micrometer is accurate to ±1x10-5m. This will then have to be squared to find the area, which will double the percentage error, causing it to be the most likely source of error. Other potential sources of error include the length of the wire, as it is not exactly straight and the wire being used heating up, effecting resistance, but these were identified in the plan and measures were taken against them. I turned off the power supply between taking readings and limited the current to 0.50A, in order to prevent the wire from heating up, which would alter the value for resistance. I repeated each reading three times and will find an average value for each, reducing the effect of anomalous results. I took six separate readings for diameter and will find an average value, to take into account discrepancies with the diameter at different points on the wire and due to the large percentage error involved with wire diameter readings. I fixed the wire to the ruler at four evenly separated points, in order to keep it as straight as possible to reduce errors with length measurements. I believe that my conclusion is reliable due to the quality of the line of best fit. It is a straight line that passes through zero, which is the type of line that I expected. All the points pass very close to the line, with only one slightly anomalous result. Furthermore, the gradient of my line gave me a value of resistivity close to that which I expected. I think there is very little I could do to improve the practical set-up for my investigation. I could possibly have used a variable resistor to be more accurate in taking voltage and current measurements, but my results were accurate enough. To further improve the reliability of my investigation, I could look at Nichrome wire of varying diameter, to see if they had a consistent value for resistivity. 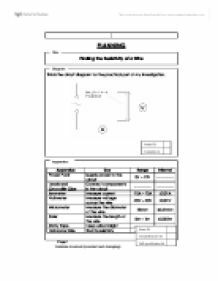 To do this, I would use the same set-up for the investigation, but take measurements using about five wires of different diameters. I could use the same calculations for resistivity for each wire. To continue the investigation, I could compare Nichrome wire with other materials, such as Constantan. So Length (independent variable) is put into the x-axis, and Resistance (dependent variable) is put into y-axis. If the length equals 0, there must be no resistance. Hence the straight line should pass the origin (c = 0). R is proportional to L; therefore the greater the length, the higher the electrical resistance would expect to be. so that 90cm of wire is in the circuit. 90 cm, rather than the whole metre, is used as the first value as the edges of the rule may be slightly rubbed off, so measurements at the very edges would not be as accurate as the taken from the centre of the rule. The relevant property of the material is its resistivity. VOLTAGE AND CURRENT VOLTAGE Voltage is the 'push' which makes a current flow through a wire. We can distinguish between two types of voltage, one being a voltage where the charge is losing energy, such as through a resistor on the wire like a light bulb, this is called a potential difference. All electrical current has energy stored as Potential energy, the voltage transferred in a circuit is measured as energy delivered by each coulomb of electricity. This is Potential difference (P.D), potential difference is the measure of voltage difference between two points within a complete circuit. been used so that any change in the resistance can be detected easily. -Heat from other sources can easily affect the experiment because they can affect the current and therefore the voltage any place in the contacts like the standard wires, the cells and the multimeters. Current isn't used up but it does give up some of its energy to the components of a circuit (e.g. bulbs or motors). In series circuits the current is either ON or OFF, the switch open or any other break in the circuit will stop the current flowing everywhere. Current supplied by the power pack. Current is one of the factors which affect the resistance of the wire. It can affect the resistance of the wire. So if the current increases the resistance will also increase. This is because resistance is directly proportional to the current.